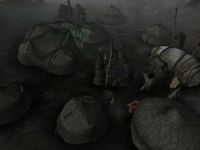 The Urshilaku Camp is in the northwest corner of the Ashlands region, above the Foyada Bani-Dad. Travelers wishing to find the camp can go up the foyada from Maar Gan, or east from Khuul. Watch for the pass on the eastern side of the foyada, which is located north of two Dwemer ruins, visible but not accessible from the foyada. Striking east, there are a few moderate hills, as well as the Daedric shrine of Assurnabitashpi. This shrine is well avoided by any but the hardiest of explorers. The Urshilaku Camp is not too far beyond the shrine, on the far side. The Urshilaku are the westernmost of the Ashlander tribes, their territory covering the northwestern side of the Red Mountain. They are ethnologically interesting, and are perhaps the most traditional of the Ashlander tribes, maintaining a strong link to their cultural past, and traditions of the Dunmer hero Nerevar. Nowhere is the Nerevarine Cult stronger, and Nibani Maesa, the Urshilaku wise woman, is a recognized guardian of the cult as well as the Ashkhan of the Urshilaku, Sul-Matuul. The Urshilaku, like all Ashlanders, are not very open with strangers, but they are not generally hostile if their ways are respected. Every effort should be made to understand Ashlander customs before traveling in the area. While the Urshilaku are interesting culturally, travelers would also be advised to take their own supplies. The camp has only one trader, Kurapli, and she has a very limited range of merchandise. Kurapli Seeks Justice: Take vengeance for the death of Kurapli's husband by killing the outcast Zallay Subaddamael. 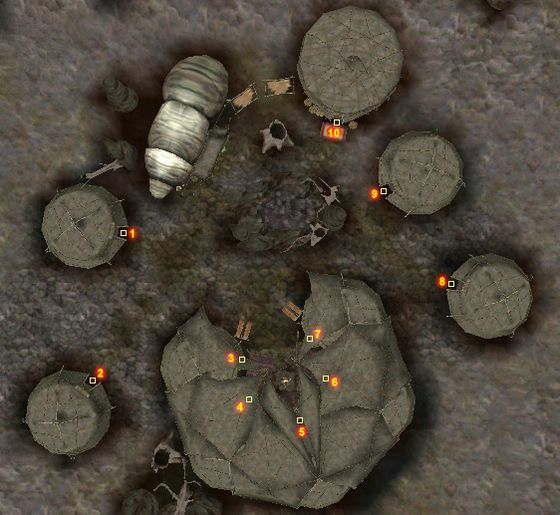 Urshilaku Camp also appears in ESO, but in a different location. They are evidently a nomadic tribe.